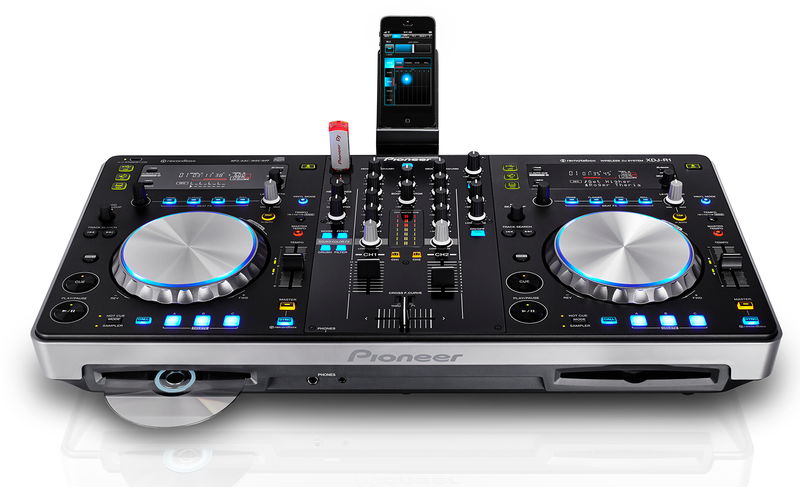 The new Pioneer XDJ-R1 has USB, CDs, line/phono-ins, and iOS remote control. 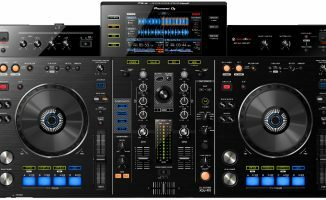 Pioneer today announced the Pioneer XDJ-R1, a DJ controller that can play music from USB, built-in CD players or external line/phono sources, and which has a host of mobile DJ-friendly features including mic in and booth and XLR outputs. It can also operate with a laptop as a “normal” Midi/audio interface controller, and ships with Virtual DJ LE. But its unique twist is the way it wirelessly adds controllerist-friendly functions via iPhone, iPad or iPod touch and a brand-new app, Remotebox. Read on for a full summary, our thoughts, a talkthrough video, how to get a demo of the software, pricing, and a link to Pioneer’s official info. 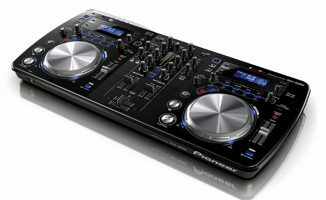 The Pioneer XDJ-R1 looks similar to the previous model in the XDJ range, the XDJ-Aero. But whereas the XDJ-Aero can stream music wirelessly from any device running Rekordbox, the XDJ-R1 drops that capability, instead adding the ability to remote control the unit from any iPad, iPhone or iPod touch. A two-channel controller, it features a built-in sampler, three cue-points buttons, and a rubberised rack at its rear onto which you can perch your iDevice (definitely iPhone; not sure about iPad, although it appears that’s what they’ve done in the demo video). Your iOS device then connects to the XDJ-R1 wirelessly (there’s no wired option at all). The XDJ-R1 has its own built-in WiFi network, and connection to the iDevice and the Remotebox app happens via this. Once your iOS device is connected, a small light confirms the connection, and Remotebox is active. While traditional “remote control” is indeed possible (the mixer, decks, FX, library etc can all be managed from the app anywhere within reach of the XDJ-R1’s wireless network), one of the main uses of an iDevice with the XDJ-R1 is as a large screen while you’re stood right in front of it. Because while the XDJ-R1 works fine on its own, with an iDevice plugged in you are given extra options that add a decidedly controllerist twist to what would otherwise be a pretty traditional all-in-one mobile DJ-style unit. What you actually see on the Remotebox screen adjusts in portrait and landscape modes to make most use of the screen space available, and you can choose which area to focus on, too. For instance, there are X/Y pads to control the Beat and Color FX, both of which are drip-downs from Pioneer’s more expensive pro DJ gear; there’s a “needle drop” for scrubbing through tracks; it offers better control over beat-matched loops; and most crucially, you get clear control over your library. This is just as well, taking into account the disappointingly limited LED screens provided for each deck. From the iDevice, you can easily access all of your playlists and folders, drag tunes onto decks, and search using the on-screen keyboard. The unit appears more substantial than the XDJ-Aero, and has a metal faceplate. It’s important to note that no musical information crosses the network between iDevice and XDJ-R1; the music is on your USB drive, and needs to be organised using Pioneer’s Rekordbox software. Although this software is also available for the iPad and iPhone, you’ll still need a laptop because that’s how you’ll get the Rekordbox-organised music library onto a USB drive to plug in to your XDJ-R1. Also, all the hard work (ie the FX processing etc) goes on inside the hardware; again, the iDevice is only controlling it. Of course, this is a true standalone unit, and you could equally simply DJ using CDs or even two line/phono sources added at the back, all without pairing up any iDevice at all. Thus it can be called a true “all-in-one” – whatever style of DJing you want to do, it can cope. there’s actually quite a lot to this controller, and Pioneer’s talkthrough video is very good, so we recommend you watch it (it’s below) to fully understand the feature set. The XDJ-R1 follows Pioneer’s philosophy of not needing an actual computer involved in the playback of the music itself; in this instance, the iDevice is simply interacting with the Reckordbox-organised music library that’s “physically” attached to it via the USB drive. There’s absolutely nothing wrong with that: In fact I think it’s rather neat, and it also provides a seamless “upgrade path” for DJs wanting to start at a (relative) entry level with an all-in-one controller, then “graduate” to Pioneer’s pro gear in DJ booths, while not having to relearn as much as those making the same leap from full-on DJ software-based solutions like Traktor and Serato. It’s lovely to see the iPad’s screen used how I think it makes a lot of sense – as a great library browser and to control extra features of the hardware. However (and for me it’s a really big “but”), Pioneer seems to have missed a glaring chance to have two big, chunky parallel waveforms right there in front of the DJ – surely the most obvious use of all that screen real estate? The addition of this I think would have laptop DJs in their droves seriously considering this solution, as it packs a lot of the advantages of digital DJing without many of the perceived issues (mainly, having to lug a laptop around with you). You’re still going to want to use a laptop to prepare your library in Rekordbox and transfer that library to a USB… but Remotebox can take over from there. As it is, though, this is still an appealing and innovative controller. Dropping the (to me rather gimmicky) wireless music streaming features of the XDJ-Aero for a promising v1 of an app that can be used as a good library browser, to control extra features, and as an all-out remote control for keeping control of the music when temporarily away from the XDJ-R1 (mobile guys will think of triggering jingles and countdowns, for instance) is a smart move. 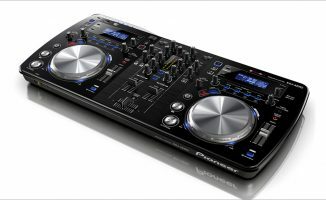 Pioneer’s addition of pro ins and outs and CD players has made it a viable and capable mobile DJ solution, and I can see mobile guys who want to explore some of the techniques usually employed by club or laptop DJs finding the XDJ-R1 appealing. If they’d just added waveforms, we’d be seriously thinking now whether Pioneer had just landed a significant blow on software DJing as a whole. As it is, the XDJ-R1 is definitely another step in that direction, but will probably be received by laptop DJs as a “not quite there yet”. What do you think of the XDJ-R1? Is this the ultimate mobile DJ solution? Is Pioneer going down an interesting path here with Rekordbox / iOS remote control? Please share your thoughts in the comments. Nah that’s very untrue, CDJs are still very well the industry and club standard for dishing out tunes. But as of late, there have been more space on the console to place a laptop stand but laptop & controllers have not taken over CDJs yet, and don’t think that will happen anytime soon. you can use it as standalone .the 350 pack has less features and costs more.the numark mixdeck quad costs the same as the pio unit. If someone has club djing aspirations this is an affordable option to get familiar with pioneer gear also a $500 retina iPad or $350 iPad 2 is a cheaper option than buying a $1000+ laptop imho. As for 4 deck control, most mobile DJ’s like myself 2 channels is plenty. Lastly being able to play off USB without a laptop is just icing on the cake. dude, you really are missing Pioneer’s point. They want the laptop out of the DJ booth. This is why they havent included waveforms in the remotebox app. They do not want you looking at the screen to interact with the music… they want you to listen. Whether you agree with them or not on removing the visual element and the laptop, this is their philosophy. To be fair, I think Pioneer’s philosophy is to make money! Remember, Pioneer also makes DJ gear that works with laptops and software. Lose the CD drives (I haven’t played a CD in years & it would make it thinner). Add “proper” 3 band EQ on the mic channel. Give me parallel waveforms on the iPad app. Do all 3 of these, & i’d buy it in a heartbeat! Definitely picking one of these up – ticks all the boxes for me as the next level up from DJay and the Spin. £849? Just take my money Pioneer. I’m totally debatting myself if I should get it. Would be grate to have so I could have a full rekordbox setup at home. I’m not sure because I’ve just found a perfect was to intergrate my Mashine into my DDJ-SX Traktor setup. Well, Maschine will come with you. Not even the DDJ-SX had as many buttons or sounds as Maschine does. 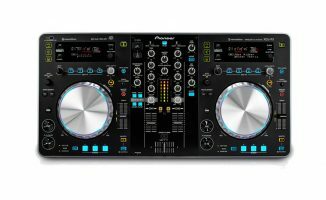 I saw this floating around a month ago on the interwebs(also mentioned in the rekordbox manual which kind of soft leaked it unintentionally), as a mobile DJ this is the product I’ve been waiting for from pioneer albeit some disappointment with screen on the hardware(was getting ready to purchase a DDJ-SX), glad I held off, will it work with traktor?, also Phil how does rekordbox handle massive libraries? Hopefully pioneer will update the software and allow waveform display. Rekordbox has, in the experiences of some DJs I talk to, traditionally struggled with really big libraries. Not got any recent experiences to relay to you though. I think this looks like a great thing for mobile/wedding DJs. Maybe bar DJs as well where beatmatching/mixing isn’t as important as “playing the hits” and entertaining the crowd with personality. Yes but,$500 more than the mixdeck and $300 more than the quad just to use remotebox? Nah! Have you test this one? No, it’s very new – we’ll test it as soon as we can. The omission of waveform displays is a deal-breaker for me. Not sure why they were excluded…maybe on purpose so as not to “outdo” they’re overpriced CDJ’s??? +1, but it would cannibalize the sales of their cdj and djm line plus who is willing to pay $2000 for a controller(I can get 2 denon sc2900 or 2 cdj-850 and a mixer for that price). I agree with Phil. Wish it supported waveforms on the hardware and the remote app. If it had that plus 8 cue points instead of 3, I might consider ditching my laptop. Also I’d like to see a thinner, more portable version without the CD drives. USB sticks are just way more convenient in my opinion. I think it’s a smart decision to have the music source attached to the device, but it would be nice to have the option to stream music wirelessly from an iDevice as well. Although I am not considering this unit, I do think it is a clever thing to stick in CD players. I have had several USB sticks go south on me (like totally unrevivable!). Especially if you plan on playing someone else’s (untested) USB stick, it is good to know there is a CD backup plan lol. Streaming from any device, be it bluetooth or wifi is a bad idea in any live setting, not only because of the inherent unstable performance character of the wireless connection, but even more because of the latency involved. I’ll always plug in a cable to my iDevice. But it’s not streaming, just control information. I took that as a sign of wanting to actually stream music from an iDevice. I understood that the remote control feature of this controller is control info through the air only :-). I am just gonna sit back and wait who brings out the first native support for the iDJ Pro: DJ Players (already in landscape mode and jam-packed with features) or Traktor DJ (not in landscape yet, but definite pleasure to use for on the road beatgridding, cueing and such) which works pretty good too. Finally a quality unit with iPad integration, sounds like an awesome piece of kit for mobile DJs. can you record your mixes on recordbox, like you can on traktor ? It’s library software, not DJ software. No “decks” or anything. can’t decide between CD, USB, Laptop or Tablet? Do all of them at once! I was thinking, how about if they made a controller with a SSD in it, with like 1 cd drive, so that way every medium is covered. All that would B needed is a iPad. hi guys, I just bought the xdj aero W, but didn’t receive it yet. JUST KNEW TODAY ABOUT THE XDJ R1 , it looks great, but does it work with rekordbox from android phone ( S4 ) like the Xdj aero. or only thru remotebox app and with Apple Products.? or it works with both? Can’t decide on xdj aero or ddj sx ? Before laptops became super popular, I’d still see DJs quickly flipping through their vinyl crates and CD books. It’s not like anything has changed… Just the direction the DJ is facing when searching for tunes. Gotta admit, staring at an Apple logo all night does get bothersome. As I say once you’re used to something as brilliant as decent parallel waveforms, it becomes something you don’t want to live without. Accountants like calculators, but they shouldn’t need them. Doesn’t mean they’re not close to essential. the good thing about waveforms is that you can see how the song is build up, like you can on a record but you can not see it on a cd. But Phil we’re DJing here, not doing someone’s mortgage LOL. This is an art form and should be about musical passion. Let the music guide you through your ears, not your eyes. Passion for music is a prerequisite in these parts, trust me on that. It looks pretty damned awesome for the price actually except just one thing looks a little off… is it me or do the pitch sliders look pretty short…? I am disappointed that Pioneer has still not taken any serious interest in developing more Traktor-friendly controllers besides the older DDJ-T1 and the new small WeGo. 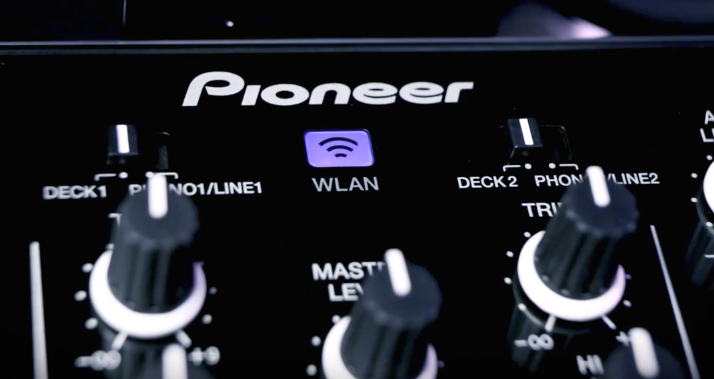 Pioneer is still heavily invested in its Hardware only in the booth mission statement. It makes Traktor compatible stuff just to keep a connection with traktor users, but rekordbox and usb support has been designed specifically to get people back off DJ software and onto just the pioneer hardware solution, only using software for track and set management and preperation. Ooops, I meant that this Pioneer device IS less vulnerable because you’re not depending on WiFi for the music source. Hey Phil, any chance you could implement the capability of editing our own posts? It would be nice to be able to correct simple gaffs and typos, etc. +1 on the edit function. It is just tooooo easy to embarass yourself on here, hehehe. +100 on not trusting wifi for pro DJ-ing. I think they realised that at Pioneer too, with the Aero. Hence the switch to remote control I am guessing. Not needing an external wifi router/access point is certainly a plus. I wasn’t too hot on this machine at first, but the thought is growing on me. I’ll wait til I can get my hands on one physically before deciding. 1) can this XDJ-R1 be mapped to most of the functions of Traktor? 2) Since it has built in CD’s, can it use Timecode from either Traktor or Serato? 1. Probably, it’s Midi. 2. Not without a Traktor or Serato audio interface. Probably not even then, there is no audio outputs from the CD’s right? exactly mate, no audio outs from CDs as is all internal. Great if they could include a nice SSD in there as well.! I’m definitely coming round to this device, the more I keep on thinking about it. My MacBook Pro is getting ready for replacing (3+ years old, Core 2 duo). Now I could buy a new one £1k plus, or I could buy one of these for less money & carry on using my older mac for library / music management & as a back up. Also sell my Denon DNMC6000 to finance a big part of it. …..it’s very tempting, when you start thinking in those terms. 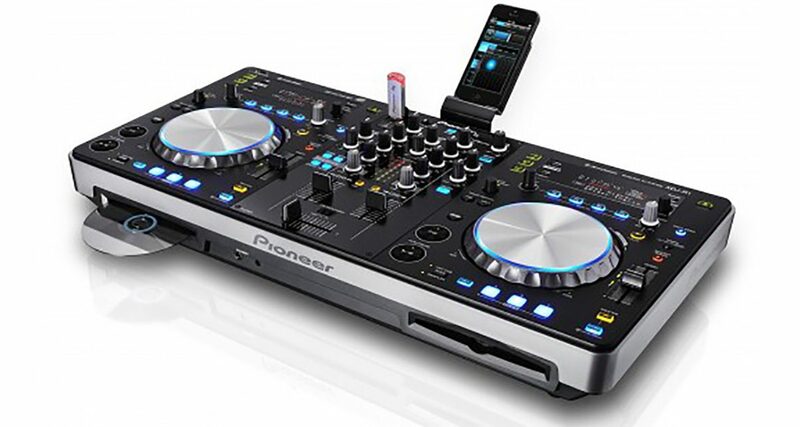 This just seems like pioneer’s version of the numark mixdeck quad…Yet it is twice as expensive. its nothing like TWICE as expensive. About a hundred dollars more. 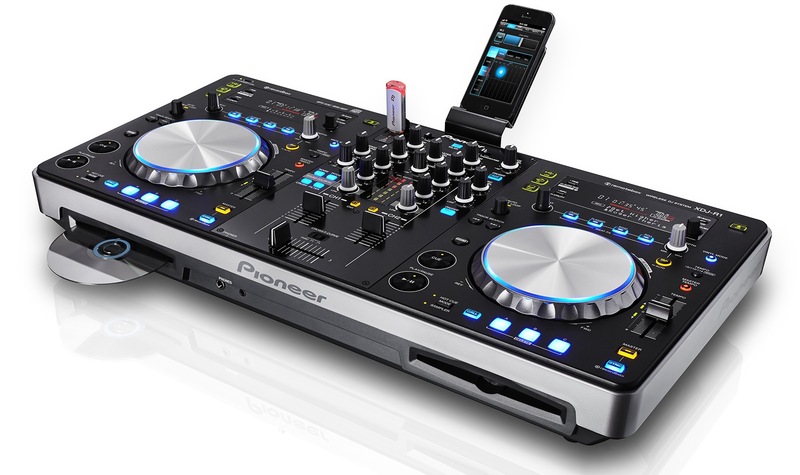 An online DJ shop contacted Pioneer after I asked about remotebox coming to Android and they said it is in development, that is a big plus for me who is not an Apple fan, my phone is an S3 mini so for me it is a free added option, going to upgrade from my DDJ-T1 for definite. STILL no reviews around……. weird! Used the unit last night in a club. It’s plagued with problems and froze twice and makes a bizarre high pitch screech for no apparent reason. I’m hoping for pioneer to sort these bugs out ASAP. just posted above on all the negative things am hearing at moment. I would hope Pioneer will eventually sort it all out with firmware updates, worst case scenario would be recalls if its hardware issues not software! Apart from the obvious issues, what is the build quality of the unit like in use… solid? How do the platters and the buttons feel, and the big question on most people’s minds is what are the tempo sliders like to use? Many seem concerned (including me) that they are too short to practically use for traditional beat-matching? Would be nice to have some hands on opinion! Is the remotebox app coming to an android device ? Waveforms or not, Pio could have probably made the song displays longer than like 14 characters. There are cheap displays, then there are displays that look at home in a 1970s calculator. If Gemini, of all companies, can put a relatively good TFT touch screen in their cdj 700s I’m sure Pio could have given us a bit more. So anyone tested the unit post firmware update yet?? Regardless of y’all’s POVs on the XDJ R1 and being a “real” DJ, I’m really considering buying my it because I’m a beginner and the last thing I need is to spend thousands on the CDJs. I’m 99.9% sure that it is completely worth buying. Any thoughts on the other .1%? All interesting comments regarding the options and the functionality, but I haven’t heard anything about the sound…….I have CDJ’s and a DJM800 but am looking to go fully digital and more compact. I love my mixer and am curious how much fidelity and control I will be losing by, what I imagine would be, down scaling to the mixer built into the unit. I’m not too tech savvy in this department, so any info or opinions would be appreciated. amazed at how little this is being talked about. Has this totally dropped off the map? a stillborn dud? what happened with the firmware issues and bugs, did they get fixed?? Everything seems to be fixed with the 1.07 update. I have found one issue, has anyone had trouble beat matching 2 Cd’s together that are not analysed in rekordbox. I have set 2 tracks to the same bpm and then the beats just fall out of place.